Buddha Amitayus, Amitayus, Amitayus statues, Amitayus bronzes. 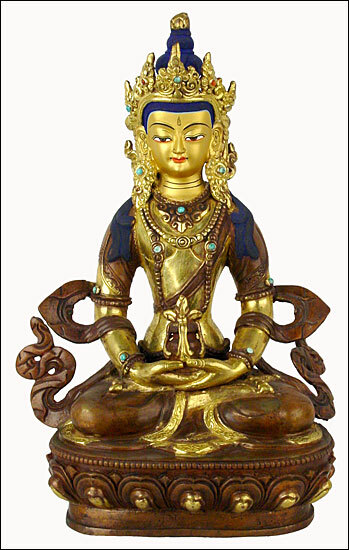 This statue represents the Buddha Amitayus (Aparmita) He is the Bodhisattwa of longevity or eternal life also known as the Buddha of Infinite Life. Amitayus is closely connected with Amitabha, the Buddha of infinite Light, and in some texts the two names are used interchangeably for the same deity. He wears the ornaments of a boddhisattwa and is red in color. Here, Amitayus is seated in a meditative posture, his hands cradling a vase (kalasha) containing the elixir of immortality (amrita) and leaves of the ashoka tree, which symbolize "a long life without the misery (shoka) of disease."